Happy day after Chrissymouse everyone! All my human family cuzzins and nieces and nephews and the sticky girl came over for the day. I gots to have real nice beef for dinner too. 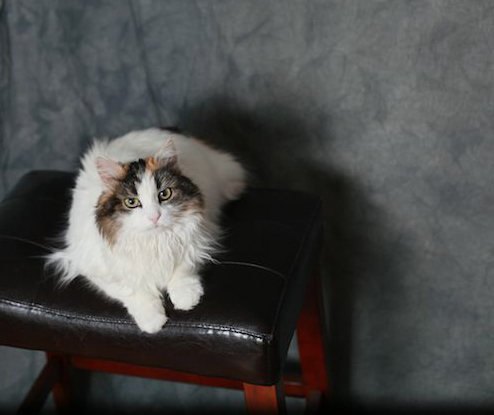 I helped the mommy get ready to take piktures of efurryone. Beau Beau used to be the big camera ham so she wuz really surprized when she actually got a pikture of me looking straight ahead! So now she knows she can use da camera wif da flashy fing where I don't see it. An anyways dis is MY chair so of course I would sit up here. Hey Mom yoo gots any leftover beast? Yum. Something does not belong on the table. Can you guess what it is? Meowhaha! Hi effuryone! It's been a while since I've posted. It's been a busy Summer for me. I've been chasing some funny lookin mousies outside, resting in between the Coneflowers and under the bushes, and watching the birds in the birdfeeder. So today after I saw the lovely Annabelle from manxmnews's Sunday Selfie I (well really it was Mommy), wanted me to join in and show off my Selfie. I say Mommy made me do it because if you can see here I'm not looking too happy. We won't bore you with all the outtakes that happened before we even got these two pictures. Well, it is SUNDAY you know and I WAS sleeping... then as I finally stopped turning my head and saw myself in the selfie camera thingy, I realized I needed to take a bath. We lovely furry lady cats do have to keep ourselves looking purrfect you know. 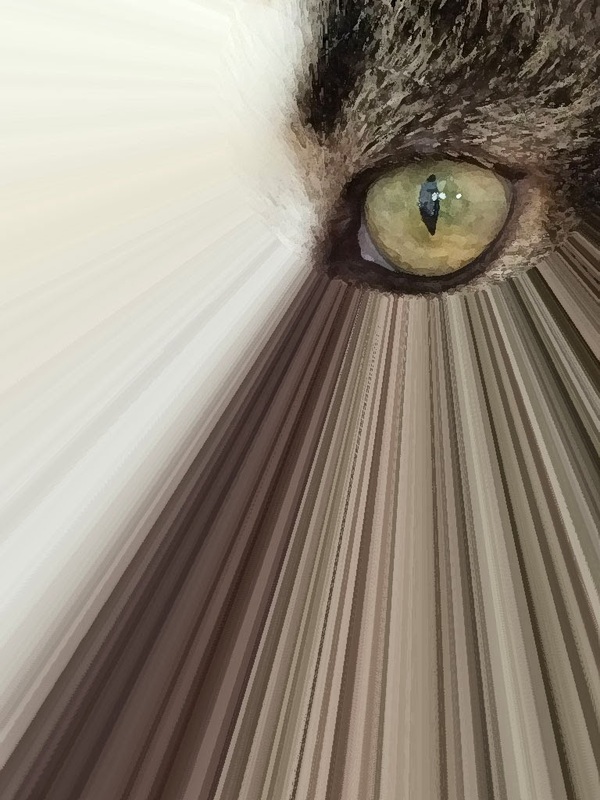 Saturday Caturday Art - The Eye has it! This is more artwork using Photoshop. I'm still using CS5 and have Pixel Bender as a plugin. This time I used the Circle Splash filter. This is one of the few times that this filter does a cool job. Now I'm thinking of other uses for it since it seems to work well centering on an eyeball. Angie makes a good "eye model" doesn't she? 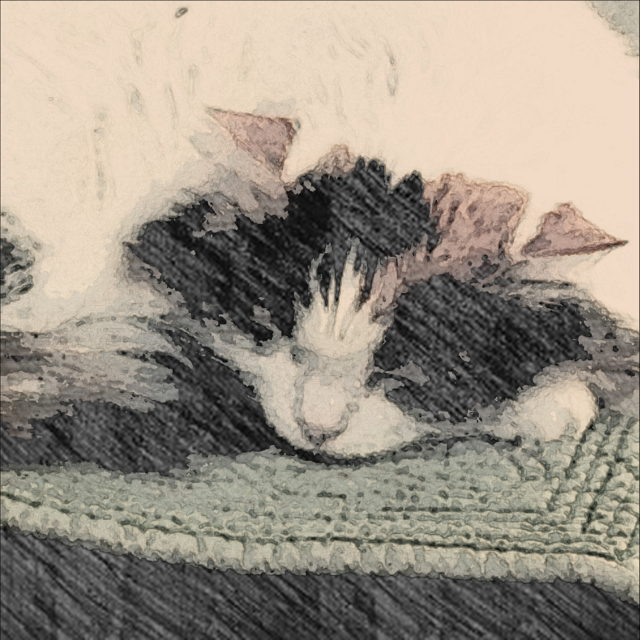 This photo's painterly look was created using Photoshop and the Pixel Bender Oil Paint filter. It's my favorite filter. You can make the brush strokes as soft or wavy as you want. It has a soft soothing look. This is one of the rare photos of Angie without her turning her head, moving, blinking, or doing something. She hates having her picture taken. I might have gotten this one with a telephoto lens from a distance away. I have two "snakie's" now! I wanted them to be in my selfie with me. Every day I put them in the hallway or near the bathroom so that Mommie can see them when she gets up. Then she brings them to me and we play together. Snakies are fun to have! I am purrticipating in a Sunday Selfie blog hop hosted by The Cat on My Head. Click the picture to take you there and join us! This is a closeup of my new sleepy spot. Mommie made me share this image made with http://picsart.com/app on her phone thingy. You know - that thing I hate so much that I turn my head every time she even thinks of pointing it my way. So the only way she got this pic was coz she caught me with my eyes closed! That is cheating, Mom! Join Caturday Art Blog Hop and have some fun! 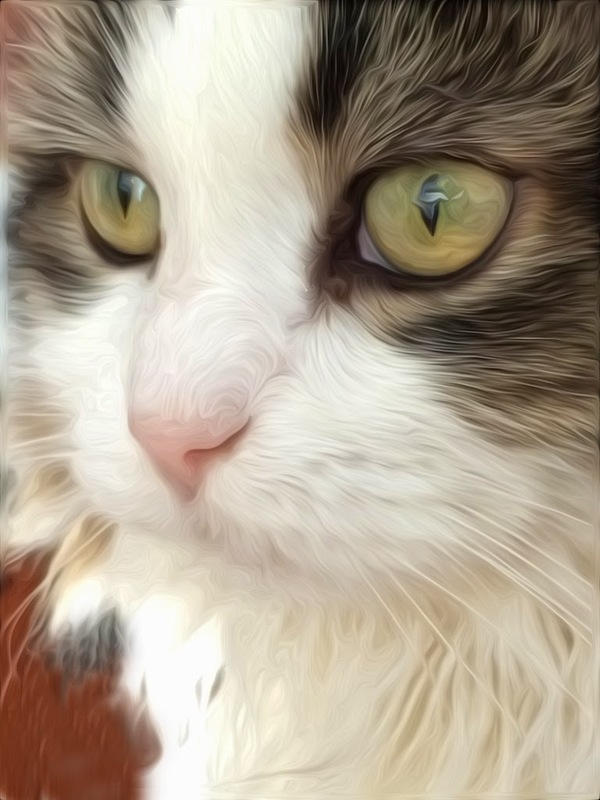 Simply edit photos of your pets using one of the many free photo editors available online, such as pixlr, picmonkey or fotor. or anything else you prefer. Enjoy creating and sharing arty photos of your pets (it doesn't have to be too artistic). Click on Caturday Art Page to see samples. Hey efurrybuddy this is our long-time blogging furriend, Honey P. Sunshine. She has just gone through a long cancer treatment because she had a fibro sarcoma tumor on her foot. Her Mommie did everything she could for her and she got the treatment she needed with lots of chemo and trips to da V.E.T. She has finally finished and is feeling better. 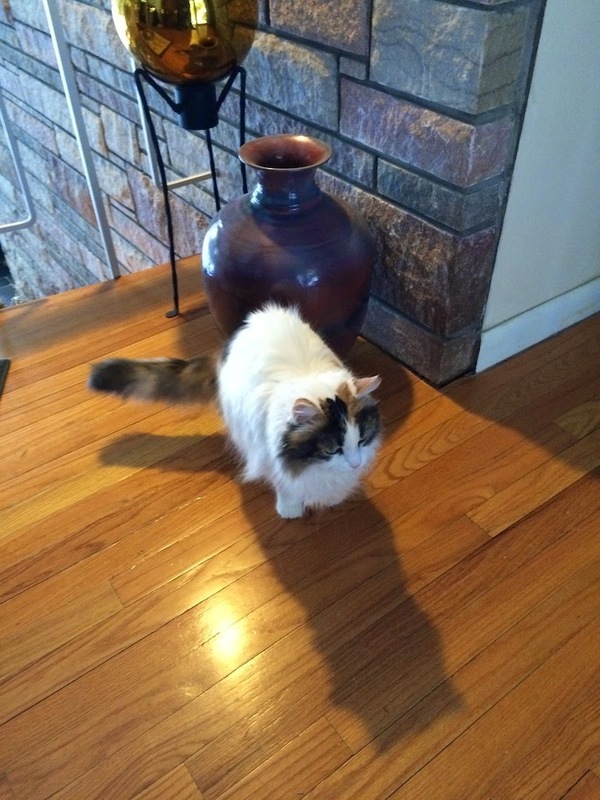 Now Honey needs your help by donating to help them get through tough times. You can read about her and see her journey through her treatment on her bloggie here and more on her story on the fundraiser page for Honey here. Honey has been blogging almost as long as we has. She also has stuck in there and commented all these years. Mommy used to go to her page to listen to some great musik to help her make it through the night in those crazy days long ago. It warms our heart to see how much Honey is loved and to see how she has made it through the terrible C dis-ease. Thanks for going to see her page and helping out if you can! I am thinking of Spring and new beginnings. Beau Beau and Angie's blog is now "all about Angie." We may have a sprinkling of former Beau Beau funny shots but for now we are moving forward. So where's Spring? When is the snow going to melt? I keep looking outside and making Daddy open the door and then when I look out I can't go in my normal spot. 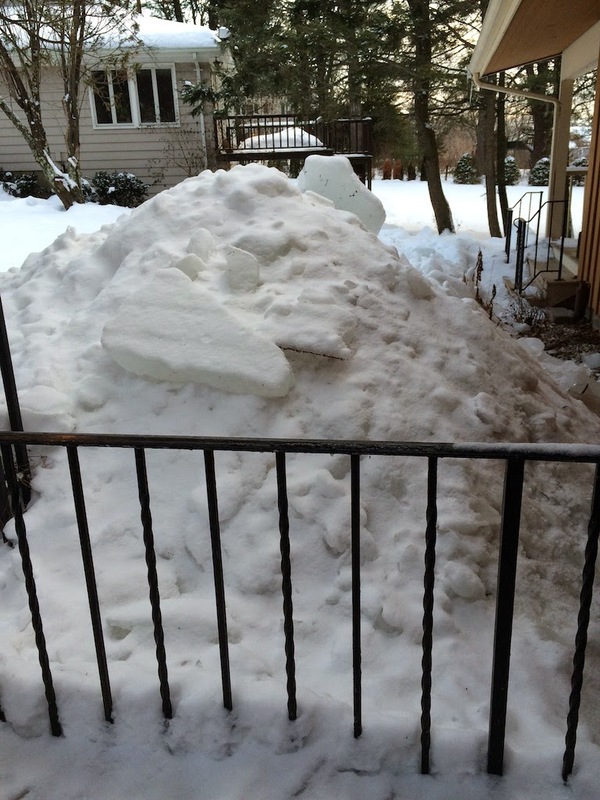 It is blocked with this snow mountain! We are praying that the water starts going to the places where it's needed a lot more than here. I think we got more than our fair share don't you? Hi all on Selfie Sunday! It's another day after snow day here in Connecticat. It's too snowy and cold to even put my pawsies out the front door. I did find a big box to jump in and hang out today on a quiet Sunday. 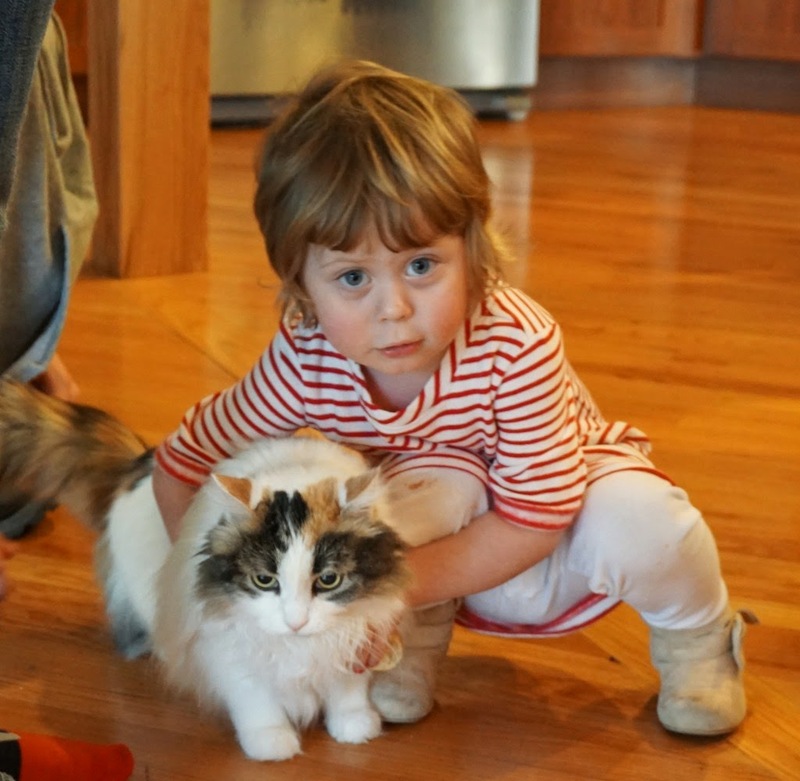 I am a furry sociable kitteh and loved it when the humans came to visit at the hollydays. I have to tell you that, yes, it is true that the little people are sticky. 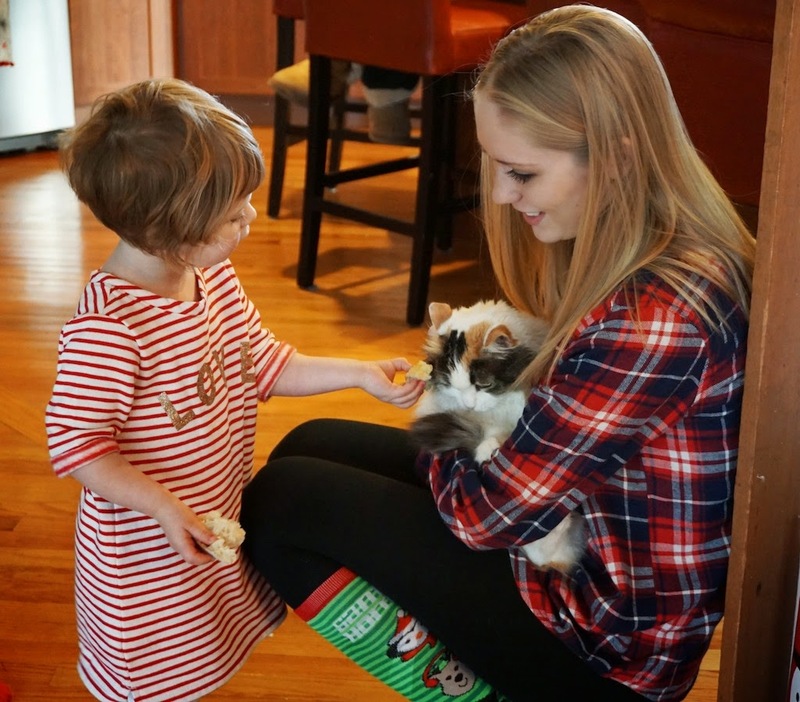 Here is my little sticky cousin, Cora, trying to give me some sticky food while my other cousin, Jessie was trying to hold me. Cora is a very generous sticky cousin that's for sure! She was being nice to me because she knew that I was missing Beau Beau (well maybe not so much...). When she first came in the house she went running to the bedroom yelling "Beau Beau"! They really did bond when she was here the first time with him. Now it's my turn. 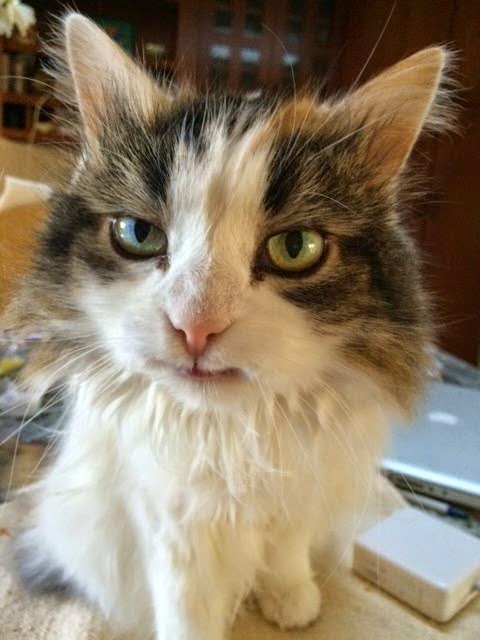 These pictures are from an old post from when Angie had to go to the V.E.T to get her teeth removed. Since there is a law being considered to bar driving with your pet on your lap in the good ole nanny State of CT, there may be no more calming the ole kitty (or Mommy) down on the way to the V.E.T. Now I know it's actually a good idea to keep your pet in a carrier to keep them and you safe while driving but I think that should be up to the person who is driving. It's just one more freedom that is being taken away from us - the freedom to make a decision. When Beau Beau was alive I would put him in his carrier and actually seat belt the carrier in. Angie is another story. In the carrier, she would claw frantically at it. With the carrier with the metal bars in the front, by the time I got her to the vet her claws were a shredded bloody mess (only about 10 mins away). When I used the cardboard box shed would shred that and be half way out of it by the time I got there. Finally, I'd put the box in the car, let her sit on my lap while driving and she'd be calm and fine during the entire ride. Here she is in the car checking things out before we left the house. This was back in 2011. Yeah - she looks like she got to drive da metal monster! haha! She probably would drive better than some of the morons that drive like maniacs past our house! I know if we drove an RV for a trip that she'd be laying right on the dashboard all relaxed and enjoying the ride! Some little girl is not leaving my side today. She is in front of the computer, on my lap, following me from room to room, wants to go out, I open the door she doesn't go out. She followed me back up to the computer, I move her back to her placemat, then she's back like she's on a bungee cord. She's my Velcro girl today :-). Ok I lied. Da lady took my picture. I had to find a place to hide a cause she kept trying to get me to take a selfie with her. 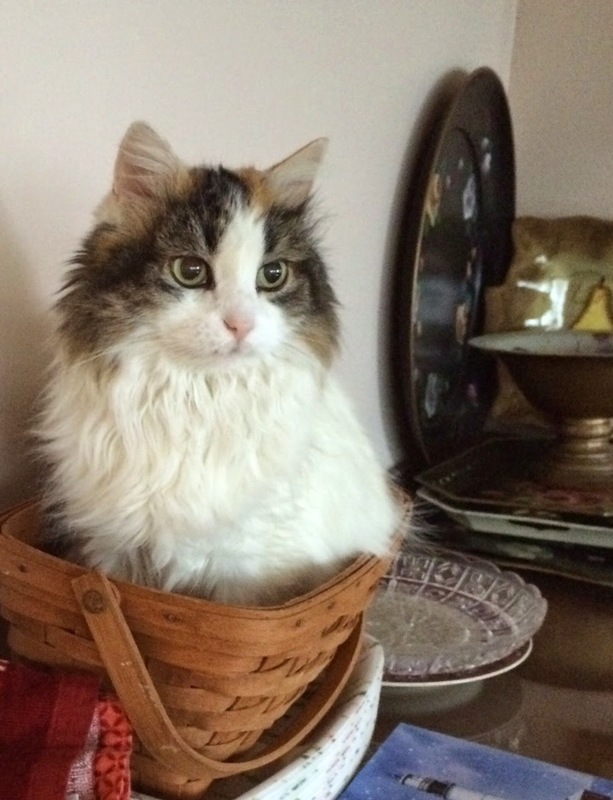 Then they couldn't find me until daddy saw me in my basket in the dining room. Have a great day on Sunday everyone. Today the beans will be watching a football game so I'm going to sleep. It's Sunday and today is a new day so today we put my Hammick (by Forty Paws) out by the stairs so I could rest on it while watching the birds. And yes, snakey came along with me. We got some snow last night. Just a little snow but enough to see the little snow birds against it. And we have the fattest squirrels around. Have a fun, peaceful, observant Sunday!